A couple of weeks ago there was a big splash about the forthcoming Ladybird Book for adults on Climate Change. (Daily Mail, Guardian, Sun, Telegraph etc.) Given that it was inspired by HRH The Prince of Wales, who wrote the forward, it should sell well. Even better, having just received a copy in a format that harks back to the Ladybird Books I grew up with. That is on each double page words on the left and a high quality coloured picture filling the right hand page. Unlike, the previous adult Ladybird series, which was humorous, this is the first in a series that seeks to educate. (a) there is a huge emerging problem with climate. (b) that the problem is human caused. (b) that there are a set of potential steps that can be taken to stop constrain this problem. (c) that the cure is not worse than the disease. (d) that sufficient numbers will take up the policy to meet the targets. My approach is is to look at whether there is sufficient evidence to persuade a jury. Is there evidence that would convict humanity of the collective sin of destroying the planet for future generations? And is there evidence that to show that, through humanity collectively working for the common good, catastrophe can be averted and a better future can be bequeathed to those future generations? That presumes that there is sufficient quality of evidence that an impartial Judge would not throw the evidence out as hearsay. Evidence for an Emerging Problem with Climate. Page 8 on melting ice and rising sea levels starts with the reduced Arctic sea ice. The only quantifiable estimate of the climate change other than the temperature graph on page 6, in claiming at the end of the 2016 melt season the sea ice levels were two-thirds that of at the end of the end of the twentieth century. Any jury would hear that there has only been satellite data of sea ice extent since 1979; that this was the end of a period known as the “sea ice years“; that the maximum winter ice extent in April was likely less in the eighteenth century than today; that ships log books suggest that general sea ice extent was the roughly the same one hundred and fifty years ago as today; and that in the Antarctic average sea ice extent increase has largely offset the Arctic decrease. The rest about sea levels correctly state both that they have risen; that the reasons for the rise are a combination of warming seas and melting ice caps. It is also correct that flooding occurs in storm surges. But there is no quantification of the rise in sea levels (about 8-12 inches a century), nor of the lack of evidence of the predicted acceleration. Page 10 on heatwaves, droughts, floods and storms states that they can cause disruption, economic damage and loss of life. there are also recent examples, and speculation about future trends. But no evidence of emerging trends, particularly increasing loss of life. This lack of evidence is because the evidence of the harms of extreme weather appear on the decrease. Indur Goklany has been a rich source of the counter-evidence over many years. Threats to food and water supply, human health and national security, and the risk of humanitarian crises are all potentially increases by climate change. The rest is just padding out this speculation. You can probably find many images of starved dead polar bears to back this up. But the truth is that this creatures live by hunting, and as they get older slow down, so are no longer fast enough to catch seals, their main food source. Zoologist Susan Crockford has a blog detailing how polar bear numbers have increased in recent years, and far from being threatened the species is thriving. The relevant quote from UNIPCC AR5 WG1 SPM section D3 says something slightly differently. The extremely likely phrase is a Bayesian estimate. It is a belief that should be updated on the best available evidence. Lack of evidence, after much searching, suggests the original guess was wrong. Therefore true Bayesians would downgrade their certainties if they cannot refine the estimates over time. But this was written in 2013. Since the Carney Report of 1979 and the previous four IPCC reports of 1990 to 2007, there has been no refinement in the estimate of how much warming will eventually result from a doubling of CO2. But how does the evidence stack up? On page 6 there is a chart of global surface temperature anomalies. That increase in temperatures can be tested against the doubling effect of CO2. Since around the turn of century the rate of rise in CO2 emissions and atmospheric CO2 levels has accelerated. But global warming stopped for over a decade until 2014, only to restart due to a natural phenomena. Comparing the actual data to the theory, fails to support the strong beliefs that GHG emissions are the dominant cause of recent warming. Page 34 go into the benefits of containing warming to 1.5C. Given that the central estimate from the climate community since 1979 has been that a doubling of CO2 will lead to and eventual rise in average temperature of 3C, a rise in CO2 levels from the pre-industrial levels of 280ppm to 400ppm reached in 2015 would give 1.544C of warming. With other greenhouse gases it should be nearer to 2C of warming. Either it is way too late (and the warming is lurking like the Loch Ness monster is the dark and murky depths) or the central estimate is exaggerated. So the picture of three young people holding a banner with 1.5 to stay alive is of the doomed who we can do nothing about, or false alarmism. Page 36 has a nice graphic adopted from the IPCC Synthesis Report of 2014, showing the liquid dripping through an egg-timer. It shows the estimate that 2000 billion tonnes of CO2 have been emitted so far, 1000 billion tonnes can be emitted before the 2 C of warming is breached. 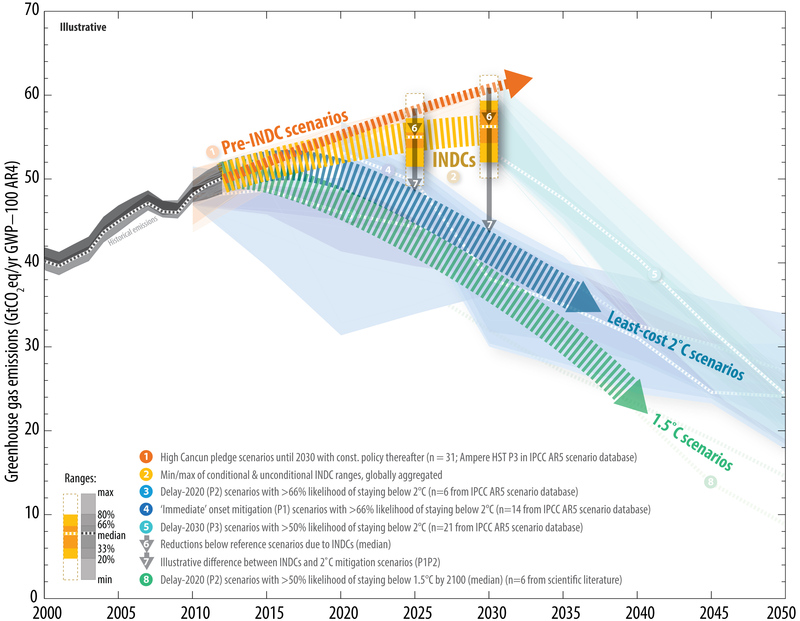 This was from a presentation to summarize the IPCC AR5 Synthesis Report of 2014. Slide 33 of 35. Problem is that this was the data up to 2011, not five years later to 2016; it was for GHG emissions in billions of tonnes of CO2 equivalents; and the 40 billions tonnes of CO2 emissions should be around 52-55 billion tonnes CO2e GHG emissions. See for instance the EU Commission’s EDGAR figures, estimating 54GtCO2e in 2012 and 51GtCO2e in 2010 (against the IPCCs 49 GtCO2e). 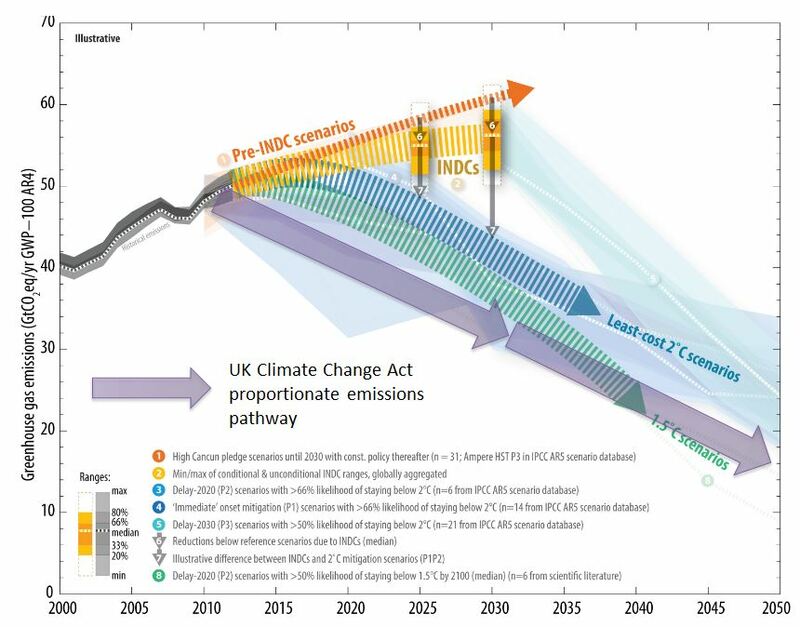 So the revised figure is about 750GtCO2e of emissions before this catestrophic figure is breached. The Ladybird book does not have references, to keep things simple, but should at least properly reflect the updated numbers. The IPCC stretched the numbers in 2014 in order to keep the show on the road to such extent that they fall apart on even a cursory examination. The worst part is at the very top of the egg-timer, coloured scarlett is “Coal, oil and gas reserves that cannot be used“. These are spread across the globe. Most notably the biggest reserves are in China, USA, Russia, Canada, Australia, Middle East and Venezuela, with the rest of the World have a substantial share of the rest. For the rest of the book to suggest European solutions like recycling, eating less red meat, turning down the heating to 17C and more organic farming, the authors write about making very marginal differences to emissions in a few countries with a small minority of global emissions. Most of those reserves will not be left in the ground no matter how much the first in line to the Throne gets hot under the collar. The global emissions will keep on increasing from non-policy countries with over 80% of the global population, two-thirds of global emissions and nearly 100% of the world’s poorest people. Below is a breakdown of those countries. These countries collectively produced 35000 MtCOe in 2012, or 35 GtCO2e. That will increase well into the future short of inventing a safe nuclear reactor the size weight and cost of a washing machine. Now compare to the global emissions pathways to stop the 1.5C or 2C of warming prepared by the UNFCCC for the 2015 Paris talks. The combined impact of all the vague policy proposals do not stop global emissions from rising. It is the non-policy developing countries that make the real difference between policy proposals and the modelled warming pathways. If those countries do not keep using fossil fuels at increasing rates, then they deprive billions of people of increasing living standards for themselves and their children. Yet this must happen very quickly for the mythical 2C of warming not to be breached. So in the UK we just keep on telling people not to waste so much food, buy organic, ride a bike and put on a jumper. There is no strong evidence would convict humanity of the collective sin of destroying the planet for future generations. Nor is there evidence that to show that a better future can be bequeathed to those future generations when the policies would destroy the economic future of the vast majority. The book neatly encapsulates how blinkered are the climate alarmists to both the real-world evidence and the wider moral policy perspectives.